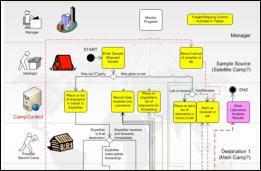 CampControl, first released in 2007, is the world's only online management system for minerals exploration. Addressing the tyrrany of distance between exploration head offices and remote operations, it is an essential efficiency, cost control and record keeping tool. CampControl provides industry best-practice in logistics, purchasing and staff management, available on a monthly subscription, turn-key basis, from anywhere in the world with an internet connection. YukonMineralTargets.com is a website created to host the results of a territory-wide minerals exploration target generation study carried out for the Yukon Geological Survey by Georeference Online Ltd in 2004. Targets were identified for 80 different deposit types using artificial intelligence techniques embedded in the MineMatch® system (see below), and are all fully auditable (ie: traceable back to the raw data from which they were identified). 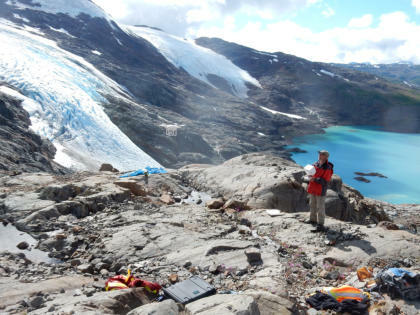 RockstoRichesBC.com is a website created to host the results of a province-wide minerals exploration target generation study carried out for the British Columbia Geological Survey by Georeference Online Ltd in 2004. Targets were identified for 27 different deposit types using artificial intelligence techniques embedded in the MineMatch® system (see below), and are all fully auditable (ie: traceable back to the raw data from which they were identified). TLE is a powerful desktop tool for creating, manipulating, reviewing and displaying hierarchical data. It uses the power of WYSIWYG editing in an easy-to-use graphical environment — all with point-and-click and drag-and-drop ease. Use it to enter and edit data, rearrange a single hierarchy, or compare and cross-edit two related hierarchies side-by-side. TLE is an essential tool for working with complex taxonomies, and is compatible with SKOS. MineMatch® is a semantic network-based computer program which assists geologists to formally document and compare exploration prospects, mineral deposits and mineral deposit models. The commercial version of MineMatch was suspended in 2006, primarily as a consquence of the lack of standards in geological terminology. Georeference Online Ltd has remained active in the field of terminology standardisation, with a view to re-releasing MineMatch once a suitable standard vocabulary has been agreed upon internationally. LegendBurster was the first commercial system in the world to provide semantic network functionality in a modern GIS environment. Semantic Nets provide a more flexible representation of point, line and polygon attributes than flat database tables, and, depending on the data, often permit significantly more powerful querying capabilities than standard SQL. Development of LegendBurster was discontinued in 2005 as a result of ESRI changing its ArcGIS develop environment from Visual Basic 6 to VB.Net. Re-developing the capabilities of the VB6 capabilities of LegendBurster remains a long-term objective of Georeference Online Ltd.
CampControl, first released in 2007, is the world's only online management system for minerals exploration. Addressing the tyrrany of distance between exploration head offices and remote operations, it is an essential efficiency, cost control and record keeping tool. CampControl provides industry best- practice in logistics, purchasing and staff management, available on a monthly subscription, turn-key basis, from anywhere in the world with an internet connection. TLE is a powerful desktop tool for creating, manipulating, reviewing and displaying hierarchical data. It uses the power of WYSIWYG editing in an easy-to-use graphical environment — all with point-and- click and drag-and-drop ease. Use it to enter and edit data, rearrange a single hierarchy, or compare and cross-edit two related hierarchies side-by-side. TLE is an essential tool for working with complex taxonomies, and is compatible with SKOS. MineMatch® is a semantic network- based computer program which assists geologists to formally document and compare exploration prospects, mineral deposits and mineral deposit models. The commercial version of MineMatch was suspended in 2006, primarily as a consquence of the lack of standards in geological terminology. Georeference Online Ltd has remained active in the field of terminology standardisation, with a view to re-releasing MineMatch once a suitable standard vocabulary has been agreed upon internationally.